One propitiates Ganesha, the elephant-headed son of the Hindu god Shiva, upon entering a Hindu temple. His prominent position at the entryway is appropriate, for he is the Lord of Obstacles, able to both instigate and remove them. According to one common version of the tale, he acquired his elephant head when his father, Shiva, arrived home from a long journey and became enraged when the young man guarding his wife Parvati’s quarters would not allow him entry. Not realizing the youth was his son, he decapitated him. Parvati exhorted him to correct his mistake, and Shiva went in search of an alternate head, saying he would return with the first he found. The snakes (nagas) hidden behind his upper hands and the one that crosses his chest symbolize his association with Shiva, and also allude to another tale. Like all of the Hindu deities, Ganesha is associ­ated with a mount, in his case, a rat. One night a cobra startled the rat that Ganesha was riding, and when he was thrown to the ground, his pudgy belly burst open, spill­ing forth the huge meal of sweets he had recently consumed. He stuffed the treats back into his stomach and used the cobra to cinch his belly closed. Ganesha is typically shown with his trunk stuck into a bowl of these same sweets, while his other attributes may vary. Here he holds an elephant goad, a rosary, and, unusually, a kundika (bottle). Another surprising iconographic detail of this figure is the fact he seems to have both his tusks, whereas he is usually portrayed without the one he lost in a battle, as he stood guard in his role of Ganapati, com­mander of Shiva’s host. 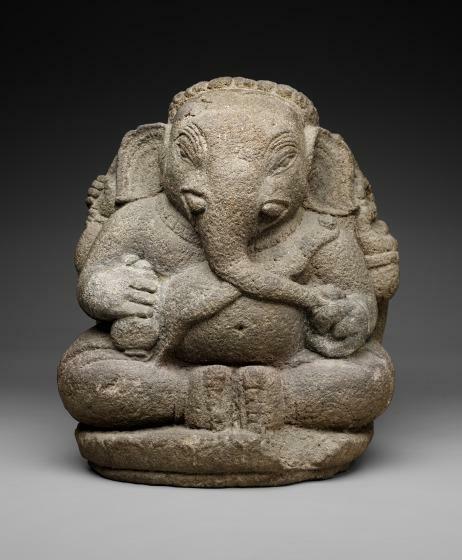 He can be depicted standing, dancing, or seated, but Javanese portrayals of Ganesha generally depict him seated, though they differ from those else­where in the Hindu world in showing him with his feet pressed together. The porous volcanic rock of Indonesia does not lend itself to fine detail, but the artist has created an expressive demeanor in the wrinkles above the eyes and the slight asymmetry of the ears. The elabo­rate curls that flow down the back of his head suggest a date during the Majapahit period when this particular hair­style was most frequently depicted.